Notes: Emergency department visits made by adults aged 18–64: United States, 2012. 1 Significantly different from private (p < 0.05). 2 Significantly different from Medicaid and no insurance (p < 0.05). Among adults aged 18–64, there were 27,500,000 emergency department visits with private insurance as the expected source of payment,17,608,000 with Medicaid, 16,728,000 with no insurance, 8,970,000 with unknown or blank, 7,482,000 with Medicare, and 4,141,000 with workers’ compensation or other types of insurance. No insurance is defined as having only self-pay, no charge, charity, or a combination of these types as payment sources. 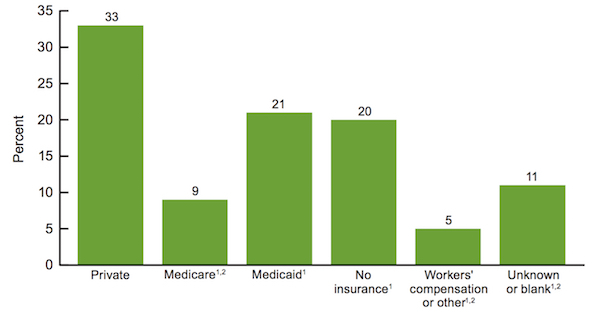 Data Source: NCHS, National Hospital Ambulatory Medical Care Survey, 2012. This entry was posted in Data Watch on July 6, 2016 by Christopher Barbey.